Generate a random number of 4 digits that can be used in a variable to verify a phone number, for example. Send this number to a third party app and validate your users by checking if their input matches or not, therefor validating if their phone number is real. You can see a demo by clicking here. And you can display this random number using the variable we custom created: @randomnumber . Bear in mind this variable won't display in any of the variables' lists. This function will be triggered once the bot loads. 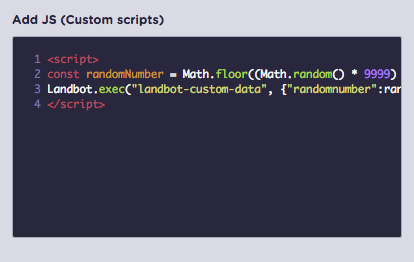 However, the random number (@randomnumber) variable won't be available until the user interacts with the bot.